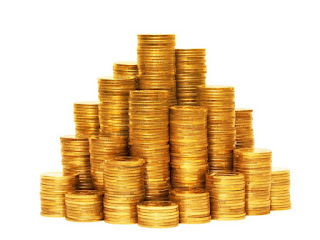 Are you thinking about investing in some gold coins and then later selling them for a profit margin? In order to be successful, you need to keep several things into account such as your budget, what kind of gold you're planning to invest in, and where you're planning to store said gold. These tips will help you get started. Figure out your budget and then decide what fraction you want to devote to coins in your portfolio. It's often beneficial to collect both silver and gold coins. For example, if you're investing around $5,000 in coins, spend around half of it on well-known gold coins like the British Sovereigns or American Eagles and the rest on 1-ounce silver coins. Find a reputable dealer that buys and sells gold coins and bullions at prices right near the spot price. Generally, you only want to buy coins 2 to 3 percent over so that the profit margin doesn't have to increase much. Consider the kilobar, which is 32 Troy ounces for the next larger option. Common sizes range from 100 ounces to 400 ounces. Consider storing gold coins and bullion bars in a locked safety deposit box at your local bank. Keep it local in case you need to get it fast during an emergency. However, remember banks are only open during regular business hours so if your financial emergency happens at night you're out of luck. Use a home safe. Choose a safe attached to the floor because these are harder for robbers to just grab and run off with. Consider putting it somewhere in the kitchen where it would be hidden by your refrigerator or dining set. Thinking about burying it as a last resort as some people do still bury their gold at night so neighbours won't see them. The advantage of this method is that your gold wouldn't be ruined in a fire, and robbers will have a difficult time figuring out where to dig. Find a reputable jewellery dealer or pawn shop like goldbuyersmelbourne.com.au that will give you a fair price for your gold. Separate your gold into different carats, where 24 ct is pure gold, 18 ct has 75 percent and so on. If it's not marked, take it to the shop anyway, and a reputable shop should be able to test your gold right in front of you. Know how much your gold weighs ahead of time and watch the scale at the shop to make sure it coincides. Keep in mind that gold is measured a few different ways. Generally, jewellers use Troy ounces, where one ounce equals 31.1 grams, but they can use standard ounces or penny weights too so make sure you know how they are weighing and paying you. Find out how the current spot price the shop is willing to pay. Generally, somewhere between 75 and 90 percent is a fair price considering it has to include insurance as well. Typically, gold coins or bullion bars will get you closer to 90 percent while jewellery may only receive 70 to 80 percent. Do you have any gold coins that you've inherited that you wish to sell? If you have any other tips, please share them below.